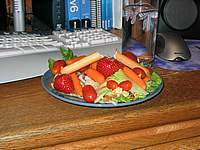 Lettuce, strawberries, carrots, and a breakstick! Strawbs in Salad? Mad boy! Put some cheese on!